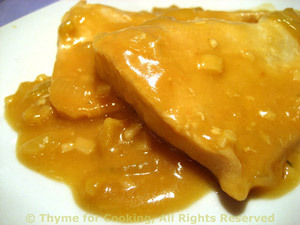 Turkey Cutlets with creamy Peanut Sauce, Thyme for Cooking healthy gourmet. Cut turkey into smaller pieces if needed. Heat olive and sesame oils in a medium skillet. Add garlic, ginger, and sauté briefly. Add turkey and brown lightly on both sides. Add stock, soy sauce and peanut butter. Stir well to combine, cover, reduce heat and simmer 10 minutes. Dissolve cornstarch in water, add to sauce, stirring until thickened.. Serve.